A Thought Provoking Banner… | Becoming Star-Lord. As I walked down the hallway of the JW Marriott (to an event I was late for), I considered the banner and the story it told. How many children go through their lives without a healthy role model to guide them? Many, I’m sure. The challenge is identifying these children, identifying mentors, and bringing them together. Identifying the children who need help is the first step, but there are many agencies and organizations already dedicated to this work. Schools, CPS, and even concerned private citizens look for signs of abuse, hopelessness, and depression in today’s youth. We have thousands of children in our CPS and foster care systems who, according to the state, need something more than their biological parents were providing. Agencies struggle to help the parents and the children. Oftentimes, though, children face uncertainty as they are moved from place to place, though the system, with no one person to lean on, look to, and rely on. That is where CASA, and organizations like them, try to step in. I’m firmly convinced that, for every child in need in our society there are many strong adults willing to be role models and guides. America is filled with wonderful, giving people. The challenge is recruiting those with a little extra time to spare, showing them how they can help, and giving them the ability to do so. CASA aims to bring these people together – the children in need and an adult willing to be there for them as they work their way through the CPS and foster care systems. Unfortunately for me, my profession keeps me moving and I don’t want to be in the position of leaving a child I’ve formed a bond with. The best I can do is spend a couple of months raising money for the people doing the work that I can’t. This banner reminded me why this project is so important to me. As always, thanks for reading and thanks to those who have donated! This entry was posted in Children in Need and tagged CASA, charity, Children, foster care, fundraising, Kids, non-profit on July 31, 2015 by Liam. Whoa! This is indeed controversial. I wonder how Nakisha feels with the CASA claiming credit for Nakisha turning her life around? Or her foster family, or bio family, or social workers, or guardian ad litem, or any of the other people who work so hard to help kids who’ve had tough breaks? As a mom to foster/adopted/bio kids, I definitely know that foster care is a team sport. Hi thebeautifulopportunity! Thanks for the comment! First, I want to say that I really respect what you do as a foster mom. Thank you. To address your comment, I don’t think it’s controversial at all. On the surface, there is no way individuals would agree to be photographed for these banners if they didn’t credit CASA for helping them in their lives. This banner isn’t about stealing credit from others. It’s about showing how CASA contributes to the process of helping children in need navigate challenges while they grow up. It’s a team effort…and there is credit to go around. CASA volunteers don’t and can’t replace the stability a “forever home” provides. They try to fill a gap. The sad thing with the system is that there is a lot of uncertainty for the child, right? They may move through a few temporary homes, to a family member, then back to foster care before finding a forever home. There are wonderful people who help them along the way, but a CASA can be a more permanent fixture in the child’s life during all the moves. What’s more, they go to a court to advocate for the interest of the child. I hope you don’t see this as controversial. Helping these children is a team effort. Great foster parents like you do amazing things for children in need. Sadly, children often take many months or years to make it to a good home, or move through many adding to the turmoil in their lives. CASA aims to fill a gap and to advocate for the child in court. 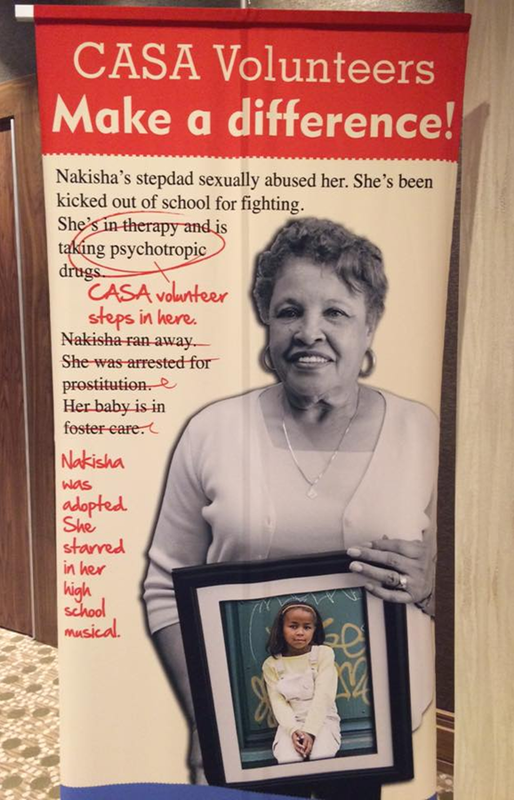 Nakisha probably had many positive influences in her life when she turned it around, but wouldn’t have agreed to be photographed for the banner if she didn’t give CASA at least some credit for what they did for her. Thanks again for reading and for what you do. This is a very beautiful and a thought provoking post, Liam. Every kid needs a strong role model in life, more so the kids that CASA helps. Really like your writing style and the cause you are supporting. Thanks Amruta! I really appreciate the feedback. Thanks so much!